This morning I headed out to the USNS Mercy to take pictures for the Embassy of local school children taking a tour. They were giddy they were so excited. I would venture a guess that none of them had been on a boat let a lone a HUGE military ship. It was amazing! 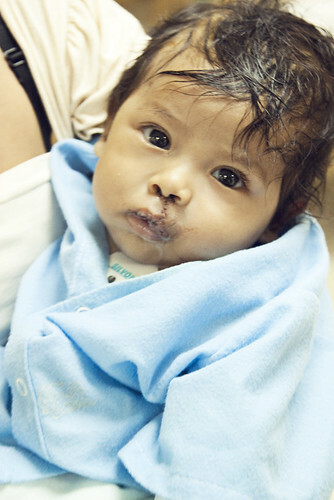 I kept tearing up seeing all the beautiful children receiving such desperately needed surgeries. This little guy had JUST come out from surgery and was so sweet. He was so cute I could just snuggle him up! This sweet little girl just stole my heart. Look at those eyes! She had been there a few days healing up from her surgery so she was bouncing all over the place. I only had a few scraps of it so I had to piece it together. Aren't they cute! I can totally upload the pattern I made for them if you are interested and do a quick tutorial. I haven't forgotten about the birthday banner. It is coming up later today! Hold onto hour hats folks the next few weeks are going to be nuts! It's always amazing to me to see pics of children from other countries where medical help isnt just around the corner. How crazy is it that the biggest struggle that I've got with my Dr is waiting for 15 minutes before my appt. We certainly are lucky over here! I love your pics, keep em coming! Ps - Yes PLEASE for a tutorial! The children just melt my heart! I love your dresses and the fact that you tied the bows in the front. My girls hate to have a big bow pushing against their backs all day, not to mention it's just plain cuter that way. Very sweet! Pattern and tutorial, yes, please!! Those dresses are adorable! you are gifted, that's for sure. I admire you for what you do. And I would totally want to follow YOUR tutorial. Aww...Thats very kind of you. Those dresses are beautiful. Will you please upload the pattern/tutorial for those? I would love to see a tutorial /pattern for these dresses...they are sooo beautiful!!!!! I would love the pattern/tutorial for this dress! How cute is that?! Love it! What an inspiration you are... Thanks!!! I LOVE these dresses. It looks like they might possibly (maybe) be easy enough for me to do. So sweet!